January 24, 2014 North Andover, MA, USA – Oxford University Press has launched a new Open Access online journal, Open Forum Infectious Diseases (OFID). OFID employs EM and the workflow system’s cross-journal transfer functionality. This allows the publisher to cascade manuscripts between OFID and another OUP journal, Clinical Infectious Diseases, supporting rapid publication and optimal placement of manuscript content. December 18, 2013 North Andover, MA, USA – Editorial Manager (EM) and ProduXion Manager (PM) Version 11.0, scheduled to enter beta testing in late January, includes FundRef integration. June 3, 2013, North Andover, MA, USA – Aries Systems Corporation, an industry-leading developer of workflow solutions for scholarly publishers, and Copyright Clearance Center, Inc. (CCC), a not-for-profit organization and leading provider of licensing and Open Access (OA) solutions, announce the integration of Aries’ Editorial Manager® manuscript submission and peer review tracking system and CCC’s RightsLink® for Open Access to provide seamless Article Processing Charge (APC) management. 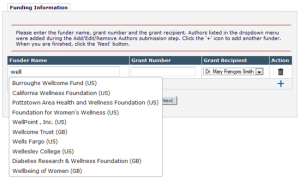 May 30, 2013, North Andover, MA, USA – Scholarly journal editors have long requested better tools to help identify candidate reviewers during peer review. Historically, Editorial Manager (a cloud-based service adopted by more than 5,000 journals) has addressed this problem by relying on internally maintained databases. Now, thanks to a new collaboration with ProQuest, an information company central to serious research, submitted manuscripts can be automatically matched with reviewers drawn from an external pool of more than 3.5 million curated scholar profiles.